CoolSculpting® is an innovative, FDA-cleared technology which allows for the removal of stubborn excess fat without requiring surgical procedures or lengthy recovery time. CoolSculpting® not only removes excess fat, but also allows for the shaping and sculpting of targeted areas, resulting in greater patient satisfaction. CoolSculpting® is based on the science of cryolipolysis, which is the freezing of fat cells by the application of very cold temperatures to the targeted area. Cryolipolysis removes fat cells without any damage to the surrounding skin or tissues. Unlike liposuction, this is an entirely non-invasive procedure, with no risk of scarring. Once the treated fat cells are crystallized (frozen), your body processes the fat and eliminates these dead cells. You may start to see changes as quickly as three weeks after your treatment, and you will experience the most dramatic results after two months. Your body will still flush out fat cells and continue doing so for up to four to six months after treatment. 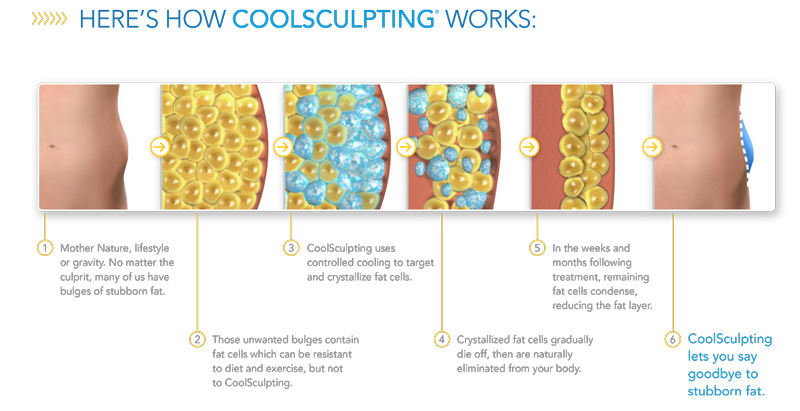 A recent study showed that CoolSculpting® produces durable results for up to five years. Why is CoolSculpting® a Safe, Smart Alternative to Surgery? The non-invasive nature of the CoolSculpting® procedure means that there is minimal down time for patients. Since cryolipolysis does not damage surrounding tissues, there are no wounds or incisions. No anesthesia is necessary, and patients experience minimal discomfort, such as pressure or extreme cold. The CoolSculpting® procedure is FDA-cleared for the flank/hips (love handles), abdomen, inner and outer thighs, arms (bra-fat), underneath the buttock (banana rolls), and double chin. With over one million CoolSculpting® treatments performed worldwide, it is proven to be a safe and effective treatment for non-surgical fat reduction. Professionals at Siperstein Dermatology Group have received specialized training to perform CoolSculpting®. They have the experience necessary to ensure that you receive the best care throughout the process. After a patient consultation and evaluation, we will determine whether you are a good candidate for CoolSculpting® treatment. Good candidates have noticeable bulges they would like to get rid of in certain areas. The CoolSculpting fat reduction procedure is specifically designed for those who have unwanted fat that resists diet and exercise. Unlike gastric bypass surgery, the CoolSculpting® procedure is not a weight loss solution for people who are obese. It is, however a non-surgical alternative to liposuction. We are dedicated to providing patients with the highest level of care and support to help you to achieve the results you most desire for your body. Should you wish to find out more about the CoolSculpting® procedure, please call our office to request a one-on-one consultation with our specialized staff to determine if the CoolSculpting® procedure is right for you. Additionally, you can attend a “Cool Event” at our office to see the procedure in action, get special pricing and learn more!